The Domains view can be used to add a domain for use by Cloudron. Once added, apps can be installed as subdomains of the added domain. 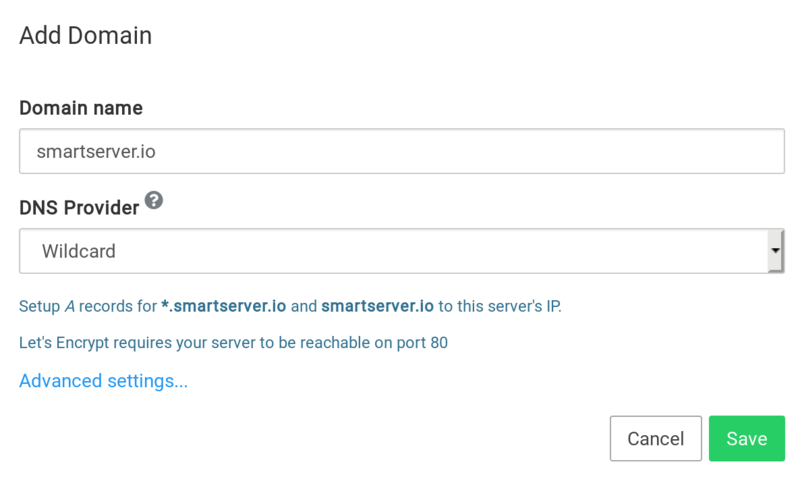 The Cloudron Email Server can also be enabled on a per-domain basis. Cloudron integrates with various DNS service APIs to automate DNS setup. 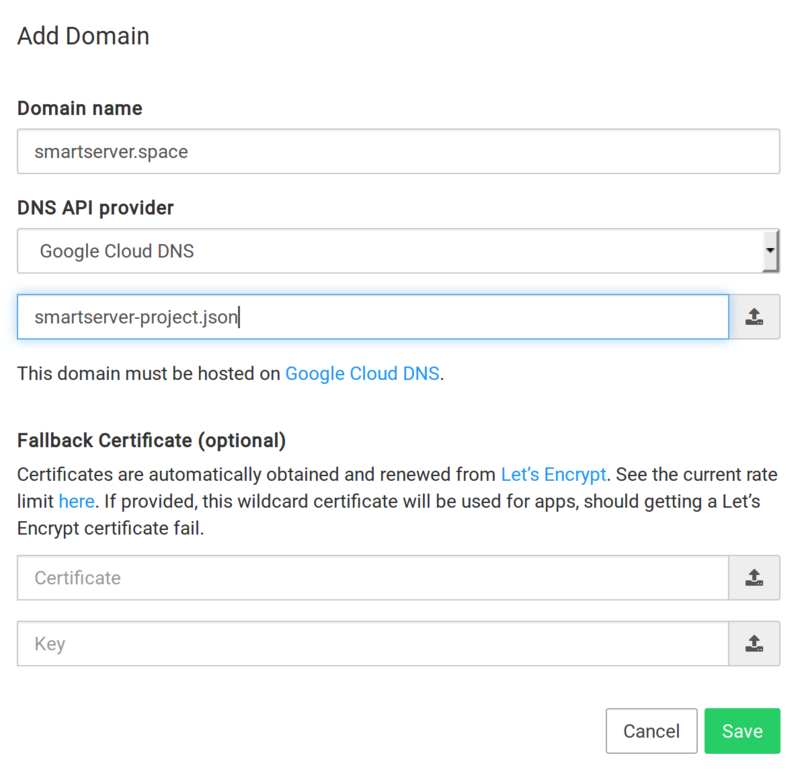 Using the API, Cloudron can also get Wildcard certificates via Let's Encrypt. This approach helps in hiding an app's domain from the Certificate Transparency Log. If your DNS provider is not supported yet, we recommend using the Wildcard provider. Ensure that your domain is hosted on Cloudflare. If your domain is not hosted on Cloudflare, you can follow the Cloudflare 101 guide. Once your domain is on Cloudflare, get the Global API Key available in the profile section of your account. In the Cloudron dashboard, choose Cloudflare from the drop down and provide the API key. Cloudron configures Cloudflare to proxy only the DNS. If you change this setting in Cloudflare to proxy HTTP traffic as well, be sure to use the Full SSL (Strict) mode. Ensure that your domain is hosted on DigitalOcean. If your domain is not hosted in DigitalOcean, you can follow this tutorial to point your domain's nameservers to DigitalOcean nameservers. Once your domain is on DigitalOcean DNS, create an APIv2 token with read+write access. 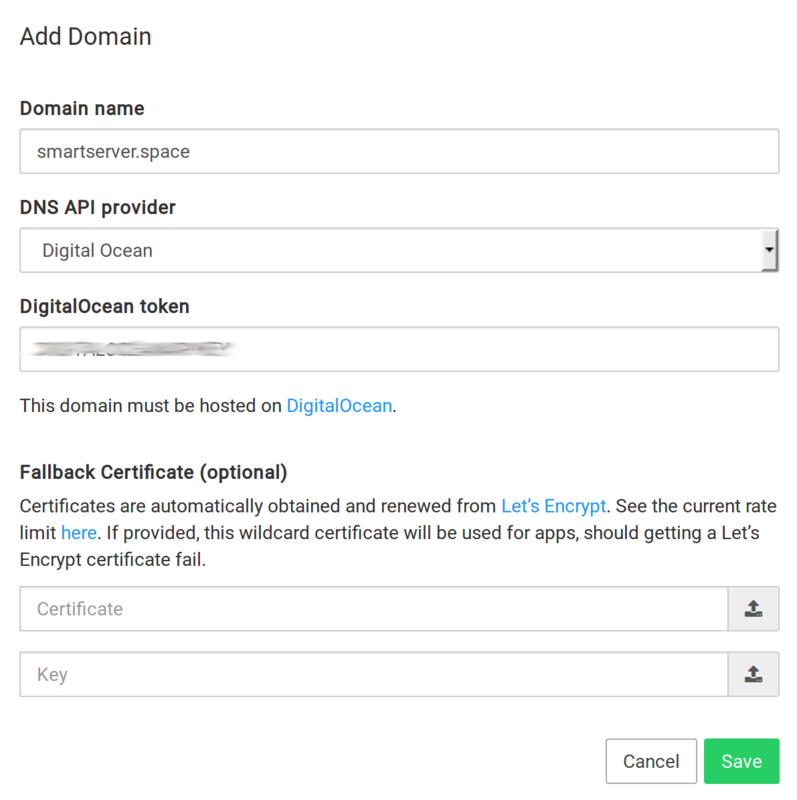 In the Cloudron dashboard, choose DigitalOcean from the drop down and provide the API key. If you purchased a domain from Gandi, you can use Gandi LiveDNS for DNS integration. Ensure that your domain is using LiveDNS. Go the DNS Records page in Gandi to verify that you are using LiveDNS. Old domains might see a Switch to LiveDNS banner. If you see this, click on Gandi's DNS Records button and wait for 2-3 hours for Gandi to migrate the domain. 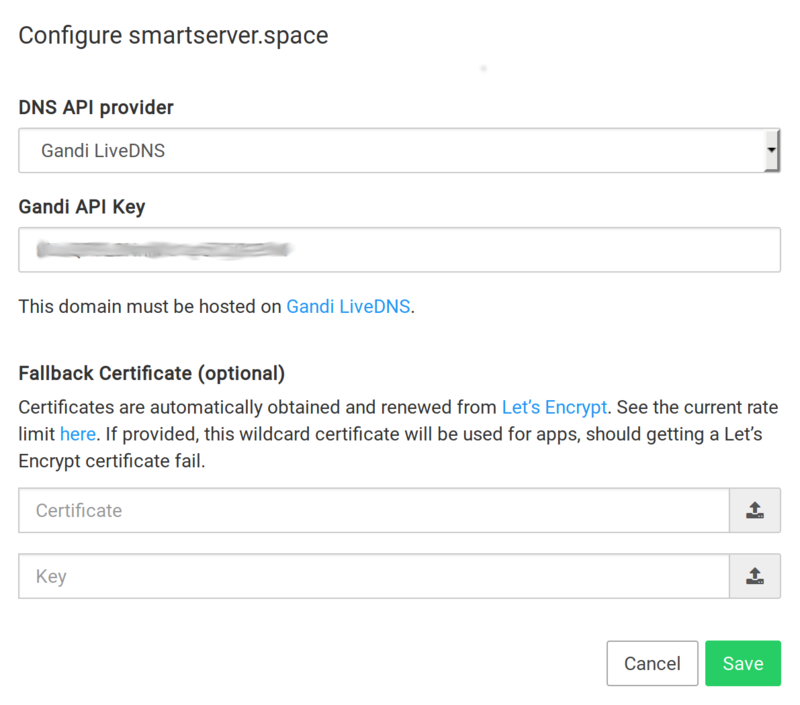 In the Cloudron dashboard, choose Gandi LiveDNS from the drop down and provide the API key. If your domain is registered with GoDaddy, you can use Cloudron's GoDaddy DNS backend to manage the DNS. 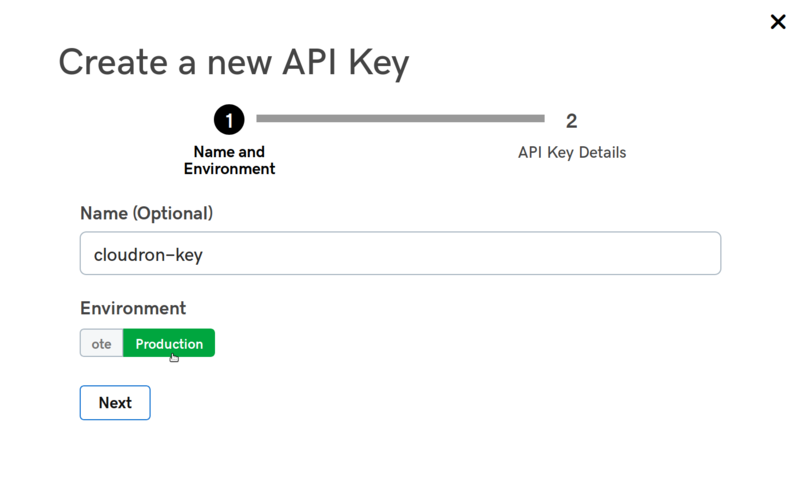 Create a GoDaddy API Key at their developer portal. When creating a new key select production environment. In the Cloudron dashboard, choose GoDaddy from the drop down and provide the key and secret. Ensure that your domain is hosted on Google Cloud DNS. You can move your existing domain to use the Cloud DNS by following this guide. Create a service account key in JSON format. In the Cloudron dashboard, choose Google Cloud DNS from the drop down. Ensure the domain is hosted using AWS Route53. If not, you can follow this guide to migrate an existing domain to use the service. AWS has two forms of security credentials - root and IAM. 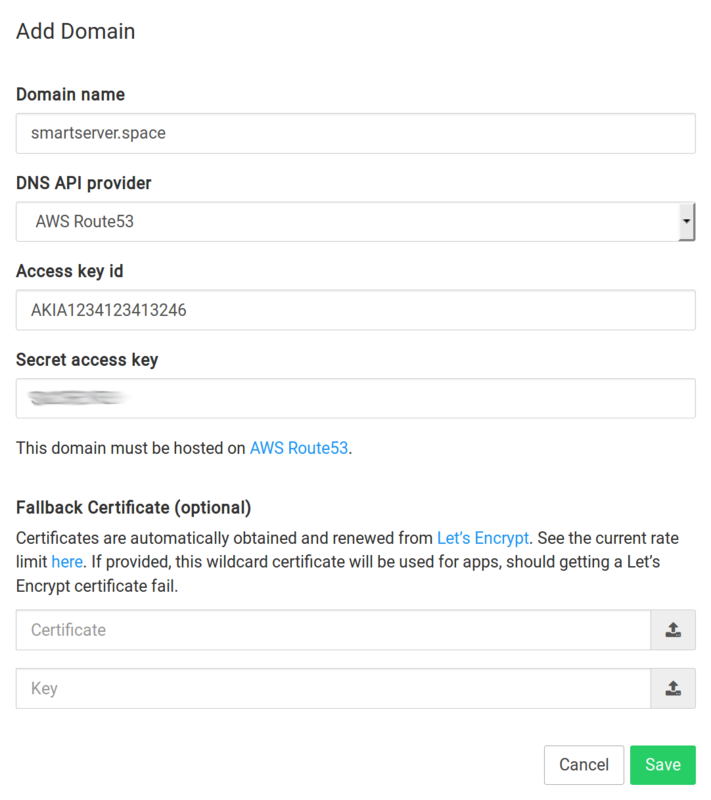 When using root credentials on AWS, follow the instructions here to create access keys. When using IAM, follow the instructions here to create a user and use the following policy to give the user access to the domain. The <hosted zone id> below must be replaced with the zone's id which is available from the Route53 console. In the Cloudron dashboard, choose AWS Route53 from the drop down. If your domain is registered with Namecheap, you can use Cloudron's Namecheap DNS backend to manage the DNS. 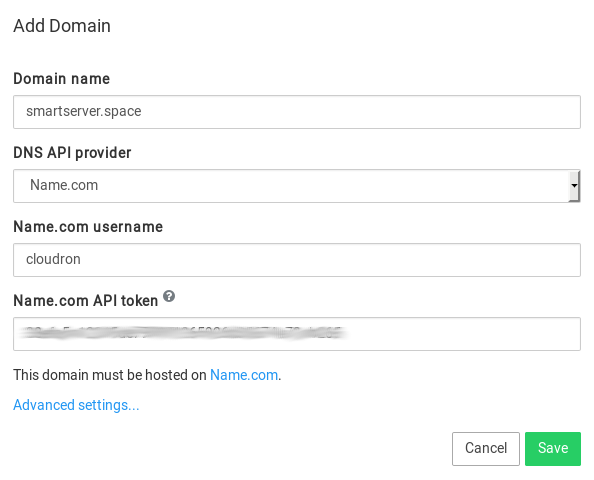 Enable API access for the Namecheap account (this is disabled by default). 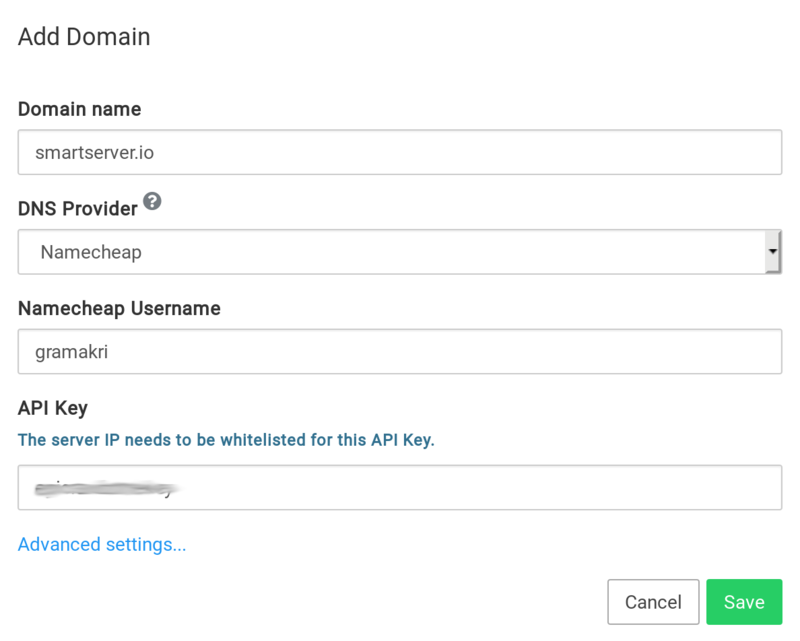 To do so, create an API key (Profile -> Tools) and whitelist your Cloudron's IP in the Namecheap dashboard. It takes a few minutes for the IP whitelisting to take effect. If adding the domain in Cloudron gives an access error, wait a bit. If you intend to enable Cloudron Email for this domain, select Custom MX in the MAIL SETTINGS and set the MX record to be my.example.com (i.e the primary domain). Once set, Cloudron will keep this record updated accordingly. In the Cloudron dashboard, choose Namecheap from the drop down. If your domain is registered with name.com, you can use Cloudron's Name.com DNS backend to manage the DNS. In the Cloudron dashboard, choose Name.com from the dropdown. If your domain is not hosted on any of the DNS providers supported by Cloudron, you can use the Wildcard DNS backend. Add a DNS A record with name *.example.com to point to your server's IP. In DNS, a wildcard entry has lower precedence to subdomains that are explicitly defined. This means that if you already have a blog.example.com pointing to a different IP address, then it will be unaffected by the addition of this wildcard entry. (Optional) Add a DNS A record with name example.com to point to your server's IP. This is required only if you intend to host an app on the naked/bare domain (example.com) on the Cloudron. In the Cloudron dashboard, choose Wildcard from the dropdown. For sending email, Cloudron requires DKIM and SPF records to be setup as well. These records will be displayed in the UI after installation and have to be setup manually. Cloudron will use Let's Encrypt HTTP validation to procure certificates for apps. For this reason, you must open port 80 of your server when using the Wildcard provider. If your domain is not hosted on any of the DNS providers supported by Cloudron, and you cannot use the Wildcard DNS provider, then you can use the Manual DNS provider. With the manual DNS provider, you have to setup DNS records prior to installing Cloudron and also prior to installing each app. App installation will not succeed until DNS records are setup correctly. Remember to setup A records for subdomains to the server's public IP and then install apps. The No-op DNS backend disables Cloudron's DNS functionality and is intended to be used for testing and development. When using other DNS backends, Cloudron will setup the DNS automatically and also check if the DNS changes have propagated. This prevents the user from hitting name resolution (NXDOMAIN) errors. When using the No-op backend, the setup and checks are disabled and you are on your own to ensure that names are getting resolved correctly. The DNS Zone Name is the domain name that is being managed by the DNS provider. By default, this value is the top level domain like example.com. If the domain and subdomain are managed by different DNS providers, then provide the zone name here. For example, example.com might have been purchased at GoDaddy. You can delegate a subdomain like internal.example.com to DigitalOcean by adding it in DigitalOcean and setting the NS records of internal.example.com to DigitalOcean DNS. In such a situation, if you use cloudron.internal.example.com as the primary domain for Cloudron, the the zone name must be set to internal.example.com. The Cloudron dashboard/admin UI is located at the my subdomain of the Cloudron's primary domain. The my subdomain is hardcoded and cannot be changed. However, the primary domain can be changed from the Domains view. Select the domain to move the dashboard into and click Change Domain. In a few minutes, you should be redirected to the new location. During app installation, Cloudron will setup a subdomain record. If the subdomain record already exists, the app installation will error with the message DNS Record already exists. This check is in place so that an existing website does not get overriden by mistake. This policy makes it easy for Cloudron admins to use the same domain for Cloudron and for external non-Cloudron apps. To use the subdomain, remove the entry manually in the DNS provider's website and re-install.